I was in grade school in the early 1960s, a white kid in an entirely white town. 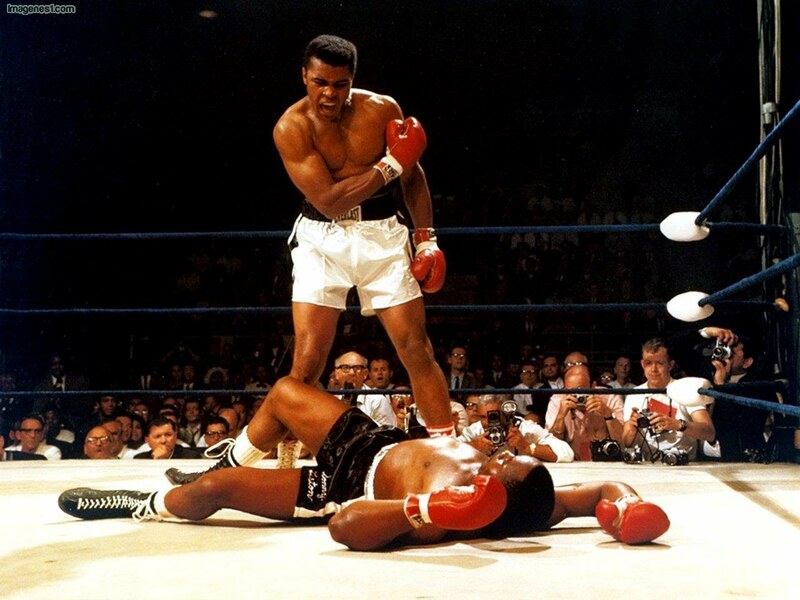 The heavyweight champion of the world at that time was Muhammad Ali, and I remember listening to the fight on the radio with my parents when he took the title from Sonny Liston. For the rematch my father took me to downtown Detroit to watch the fight on closed circuit television, and I saw the so-called “phantom punch” that a slow motion view revealed to be not so “phantom” at all. Shortly after that they began to show the heavyweight championship bouts on network television. 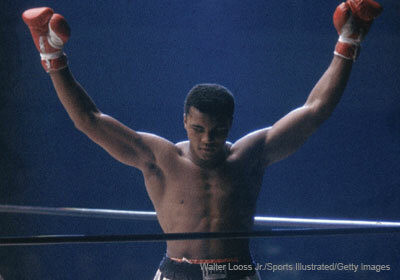 I made sure to watch every Muhammad Ali fight that I could, and I saw him dominate every match. This was his prime, and no one could touch him. No opponent had a chance. I didn’t realize at the time that such dominance was unusual; nor did I consider that his dancing, backstepping style, with his fists almost dangling near his waist, was so unique. He could evade the punches of his opponents better than anyone else could block them. I wanted to be him. My parents had bought me some boxing gloves. I had two pairs, so I could loan one to any of my friends who wanted to take up the challenge, and my friends and I would go to it in makeshift rings like any other kids would play sandlot baseball. Naturally, I would dance around with my fists down around my waist in childish emulation of my hero. During all this time there were social happenings that were, to me, only background noise. This was the time of civil rights marches and Dr. Martin Luther King, Jr. I was aware of it only vaguely. I had been told that black people wanted to be treated the same as white people because, in the South, black people were required to sit at the back of the bus. It seemed to me fair that everyone should be treated the same. But I knew nothing of lynchings or Bull Connor’s dogs. He was a member of the Nation of Islam at the time, of course. But the point is that this marked the first rift I ever had with the older generation. I had earlier believed the adults when they told me that a magic bunny came to deliver candy on Easter, but the idea that Muhammad Ali could in any way be a bad man placed too much strain on my credulity. I firmly believed that the adults misunderstood him. I knew that they misunderstood him. It was a watershed moment in my young life, because the adults were wrong. Later I heard that Muhammad Ali was doing another bad thing. He was refusing to go into the army and fight for his country. It was still a little early in my life for me to develop any sophistication on the issue of Vietnam; I accepted without question the notion that we were defending the freedom of the South Vietnamese. 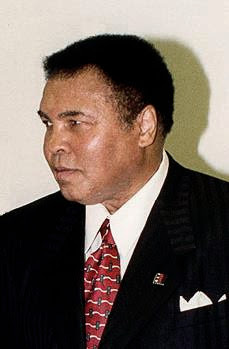 But the adults had been wrong about Muhammad Ali before, so I was certain that all was not as it seemed in this case. Then, when I heard that they were going to take away his boxing title, I was as outraged as a young boy could be. It seemed to me that they were trying to do the impossible. How, I wondered, could they just declare that he wasn’t the champion when he clearly was the champion? Here, I thought, it was the adults who were engaging in make-believe. But to my frustration they went ahead and acted as if their make-believe was real. 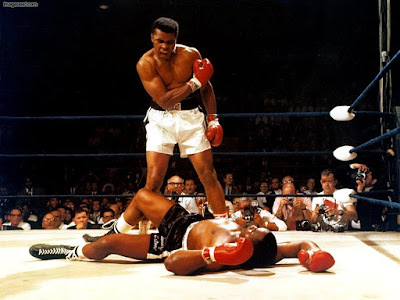 They were not only wrong about Muhammad Ali, they were also wrong about reality, and because of their self-deception I was no longer going to be able to enjoy watching my hero fight. I was in the sixth grade when Dr. King was shot. All I knew about him was that he had been fighting for the rights of black people in a non-violent way. I was unaware of having any strong feelings about him. But soon after the assassination I was watching a television program where he was being remembered. The Supremes were involved with it, and Diana Ross began to speak. Suddenly, as she was speaking, I began to weep. I couldn’t understand it, but there I was, weeping, mourning the loss of Dr. Martin Luther King, Jr. In hindsight I have to believe that there was something awakened in me by Muhammad Ali; that, because of him, and because of the treatment he received, my inheritance of the white culture’s attitude toward black people had become impossible. This is not to say that all traces of racism had been erased from me by any means, but that through my admiration for that good, great, and gentle man my consciousness had been changed forever. Now I am weeping again. We will never see the likes of Muhammad Ali again. There may come, someday, a boxer as good as him, though he remains, by consensus, the greatest heavyweight to ever enter the ring. But he left an indelible impression on the heart of the young boy that was me, and he raised my consciousness no less than Dr. King raised the consciousness of the adult world. I cannot be alone in this. Muhammad Ali and Dr. King were contemporaries, and Muhammad Ali was the Dr. King for kids. As overwhelming as he was in the ring, this will be his greatest legacy.